Why Do I Get Worms in my Apples or Pears? First of all, it's important to understand how and when the worms get into your apples and/or pears. During the summer and early fall, customers often bring us apples with the remnants of worm damage or with a worm still in the apple and want to know how to get rid of these worms. Unfortunately, at that point the damage is already done, and there is little to protect your current apple or pear crop from the worms. The only way to salvage the fruit at that point is to cut out the bad portions of apple or pear. The damage starts in the Spring when a moth known as the codling moth is busy laying its eggs at the base of your newly formed apples or pears and also on the leaves. These worms/caterpillars then hatch and work their way into the center of the newly formed apple often without detection, where they remain until they mature. Once they have matured, they work their way out of the apple or pear in mid to late summer. They then make their way down the tree and into the soil to cocoon and wait to begin the cycle again next Spring. Question: So How Do I Stop the Worm From Getting into my Fruit? The key to stopping the worm from getting into your apples or pears is by eliminating the moth. Determing the exact time that the moth is active in your garden can be difficult since weather plays a big role on when the moth is laying its eggs. Generally, they are active from about the time your tree flowers to about the first part of June. We recommend the following strategy to help reduce and hopefully eliminate the worms in your apples. One thing to remember is that if you have had severe infestations of worms in the past, it may take a couple of years to get acceptable control. 1. Spray Soil around Apple/Pear Trees. One of the first things you can do in the early Spring before the apple tree begins to bloom is to spray the ground around your fruit trees with Bonide's Captain Jack's Deadbug Brew. This insecticide contains Spinosad and is used for organic gardening. The reason for spraying is to kill the codling moths as they begin to emerge from their cocoons in the Spring. Usually this spraying would occur approximately about two weeks before the trees begin to flower. 2. Hang Codling Moth Traps. Another way to reduce the codling moth population and also to detect moth activity is to hang Codling Moth Traps in your apple or pear trees. These traps contain a pheromone lure that attracts the male codling moth. Without the male moth, the female moth won't be able to produce eggs. The traps should be hung toward the outside of the tree ensuring a clear path for the moths to be able to easily enter the traps. The pheromone lures are effective for about three weeks, so you may need to hang a second set of traps a few weeks after the first traps were hung. The first traps can be hung just before bud break (right before the tree begins to flower). By monitoring the traps, you will be able to know if the moths are active in your yard. When you see moths being caught in the traps, you can begin step 3. 3. Spray your Fruit Tree. After your apple or pear tree has finished flowering and the fruit is beginning to set, you can spray the tree with Bonide's Captain Jack's Deadbug Brew. You can repeat this spraying about every two weeks for about 3 applications. (If you have only had small incidents of worms in your apples, one application may be enough). Generally, this spraying would begin in late March or Early April and end in late May. 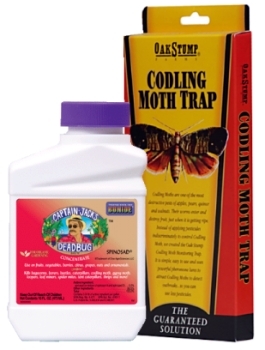 Monitoring the codling moth traps will also help you know when you need to spray. 4. Follow-up Spray. In the late summer, it might be a good idea to do a follow-up spray around the tree with Bonide's Captain Jack's Deadbug Brew to get any of the worms that may have been missed and stop them from starting another generation of codling moths. Remember that this is a recommended strategy for getting control of the worms that appear in your apples and pears. 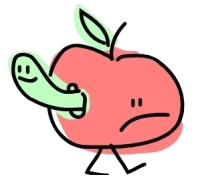 Final thought: "The only thing worse than finding a worm in your apple is finding half a worm."